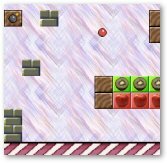 A free platform puzzle game with 35 challenging levels for Windows PC. Foul aliens from the other end of universe travelled through an interstellar wormhole and took over mother earth. Without food their reign of terror will come to an end. Click here to download the classic platform puzzle game. Our guarantee - It's 100% safe and free of spyware or adware. Your mission is to get access to all 35 store-rooms of the aliens and destroy all fruits there. When you start the game, your spheroid fruitcrusher has just entered the alien's storage building. Here you can enter the 35 rooms through the green tubes. If you destroy all fruits in a store room, you get one star. You will need the stars to gain access to new areas in the storage building. Star doors block your forthcoming. To smash a star door, you need at least as many stars as is inscribed on the door. Tubes with a star on them haven't been solved yet. There's a fan-made sequel available.